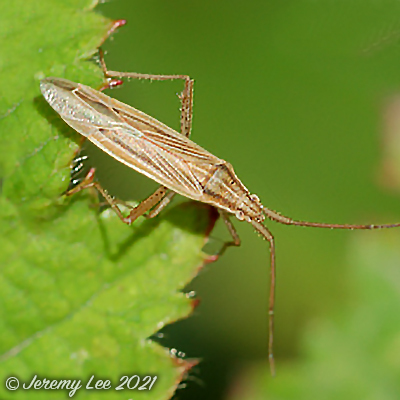 Stenodema species are elongate grass bugs with a longitudinal furrow between the eyes. The genus is best distinguished by the coarsely and densely pitted pronotum. Stenodema laevigata is very similar to S. calcarata and S. trispinosa, but lacks femoral spurs. There is a notch in the underside of the hind femora, near the apex. This species is easily confused with female Notostira elongata (often common in the same habitats). Common throughout the UK, both adults and larvae feed on the unripe grains of a number of grasses, although this species is often commoner in damper habitats than S. calcarata. Overwintering as an adult and mating in the spring, when both sexes turn green, although males are often darker than females. Larvae can be found May-July, the new generation of straw-coloured adults appearing from July onwards.